Basketball is big in Indianapolis, especially as March Madness gets underway over the coming weeks, but a visit to the NCAA Hall of Champions at Indianapolis' White River State Park gives visitors a good idea of the importance of not only basketball, but a whole array of sports to student-athletes, their development and Indiana's economy each year. 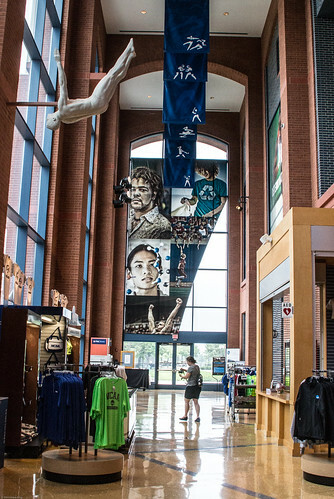 We visited the Hall of Champions last summer and enjoyed seeing the way the facility displayed the history of NCAA sports and athletes by means of interactive displays like trivia games, pick-up basketball in the facility's classic 1930s-style gym and simulated displays that allow visitors to virtually compete in a number of sports. The 30,000-square-foot facility is a museum, exhibition center and conference center that is next to the National Collegiate Athletic Association's national office. The building is interesting to me because of its architect, the well-regarded Michael Graves who specialized in modernist, and later, postmodern architecture. You may recognize his name a designer of teapots and other home goods, which is how I first became aware of him as he designed lines for Target, and later J.C. Penney's. Graves grew up in Indianapolis, graduating from the city's Broad Ripple High School in 1952. His notable architectural designs included a number of buildings for Walt Disney Company facilities through the 1980s and 1990s. He was also involved in the redesign, renovation and updating of the classic 1920s Beaux Arts museum building at the Detroit Institute of the Arts with its 1960s and 1970s additions (a total of nearly 600,000 square feet). That project also included 65,000 square feet of new construction at the DIA during the later part of the first decade of the 2000s. The NCAA Hall of Champions opened in March of 2000 after the organization moved to Indianapolis in 1999. The building's design reflects Graves' expertise in accessible design, a subject he became more aware of after an illness left him paralyzed from the waist down in 2003. The museum area of the building has two levels of interactive exhibits that tell the story of the 24 NCAA sports. I thought it was particularly good about representing both women's and men's sports, and we had a lot of fun finding the stories of notable student-athletes throughout history displayed in the exhibits. An electrical fire struck the building in November of 2007, and the hall closed from then until reopening on March 12, 2009. We certainly saw no sign of the fire damage when we toured the building, though. In a sad irony, Michael Graves died on March 12, 2015 at the age of 80. The conference center portion of the Hall of Champions hosts many events like weddings, parties and meetings for other organizations with areas that can accommodate gatherings as large as a formal dinner for 350 people. 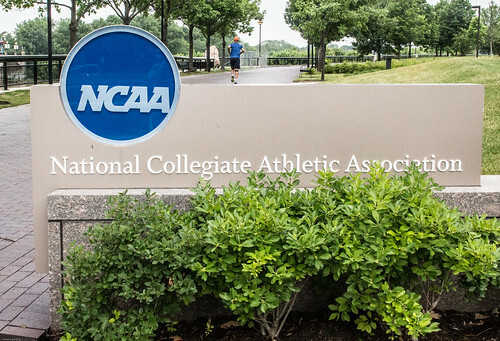 The NCAA Hall of Champions seeks to provide greater understanding of the NCAA, its more than 1,100 colleges and universities with over 450,000 student-athletes competing in NCAA sports. Each year more than 54,000 athletes compete in NCAA championships in Division I, II and III sports. The importance of sports for the athletes is certainly big, but the economic impact of the NCAA operations and events for Indianapolis and the State of Indiana is also huge. An estimated more than $183 million came through NCAA championships between 2005 and 2013. Operations and events generated more than $161 million in 2012 alone through the NCAA's daily operations, events, vendors and job creation. The NCAA Hall of Champions opens daily, except for Monday and a few holidays. You can also connect with the NCAA Hall of Champions on the Web site, Twitter or Facebook. Want to learn more about Michael Graves and his work in architecture and design? Check out Michael Graves: Images of a Grand Tour by Michael Graves with Brian Ambrosiak or Moleskine Michael Graves Inspiration and Process in Architecture.